"He sure is a busy baby," she remarked on Benjamin as we watched him toddling around (on the prowl for chocolate). "He certainly is," I agreed, tired out from a long day of chasing him around. "Were your girls this busy?" "The first one was," I said, giving a nod in Rachel's direction (please note: she was also still hunting floor-dropped chocolate). "Our second was pretty calm, which is why we figured we could have another," I laughed (and she laughed too). "Yes, they're all very different," she said. "Those are my great-grandchildren sitting on that row there," she said, pointing to a row of children sitting (well-behaved, not crawling around on the floor looking for chocolate) a few rows ahead of us. "They certainly keep us entertained, but they're growing up. I've been enjoying watching your little boy tonight. He sure is cute!" "Oh, thanks," I said. "But, wow—your great-grandchildren! So how long have you lived here?" "Oh, sweetie," she said, and sighed. I suppose it was a rather brazen question, considering she'd already admitted to having great-grandchildren older than my own children. Clearly their family is now three-generations deep in North Carolina, though I suspected that she, herself, was a transplant. I'm not very good with smalltalk anyway, and I'm really not very good at knowing what questions are taboo when speaking to an elder. I was once reprimanded in a nursing home when I asked a woman I was visiting with how many children she had ("That's an impertinent question!" she chided, even though she'd just asked me how many brothers and sisters I had and I figured (since I was thirteen at the time) that asking her how many children she had was the reciprocal question...but I guess not). I geared up for another scolding but this woman didn't chide me. Instead she got a contemplative look in her eyes, smiled, and announced, with both humility and pride, "We came here fifty-three years ago." "I'm from Provo," she said, with that same faraway expression on her face. "My husband is from Texas. He came up to go to school at the BYU and moved in next door. Everyday I'd leave my house and—boom!—there he'd be. I kept running into him. I just couldn't get away! So then he married me and carted me off." It was the most romantic love story I've ever heard and it only took thirty seconds for her to tell it. I suppose it wasn't what I heard of their love story that made such an impression, though. It was what I saw of their love story. I'd watched her wheel her husband through the parking lot and into the church building. She lovingly helped him out of the car and settled him into his wheel chair, then she rushed him to the doors—with a smile on her face and a youthful spring in her step. Fifty-three years in North Carolina. Fifty-three years after finishing a graduate program in...Michigan (¿I think?). Fifty-three years after finishing a graduate program, after finishing an undergraduate program, after getting married. They've been married a long time. I'm not sure what it was about their story that touched me so deeply. Perhaps it was that watching this woman assist her husband with such compassion reminded me of my grandma who, year in and year out, helped my grandfather from the car to the wheelchair to the chapel—an act of service and of perfect love that has been etched into the recesses of my mind. Perhaps it was that the story was so simply sweet—he was always there, he kept being there, he's still here, and he'll always be mine—that I couldn't help but notice the parallels with mine and Andrew's story. There was never anything complicated about our relationship, no thunderbolt moment when we knew we were in love. It was just that Andrew was there and then he kept being there until we couldn't imagine it any other way "so then he married me and carted me off." And I really hope that in 50 years one of us will be pushing the other into the stake center to watch a roadshow—where the acting and singing will be both terrible and wonderful but at least we'd still be enjoying spending our lives together. Because that's a love story. After the show ended I said goodbye and asked for her name, since I hadn't done that when we were talking earlier. (Remember how I mentioned above that I'm terrible at small talk? It makes me so nervous. If I were the prince in Cinderella (or, in today's instance, Catskins), I'd certainly make the same blunders the prince did and not ask Cinderella for her name and end up trying shoes on every maiden in the land. No question about it.) She waved her hand between her husband and herself and said, "We're the..."
"And what's your family name?" she asked me. 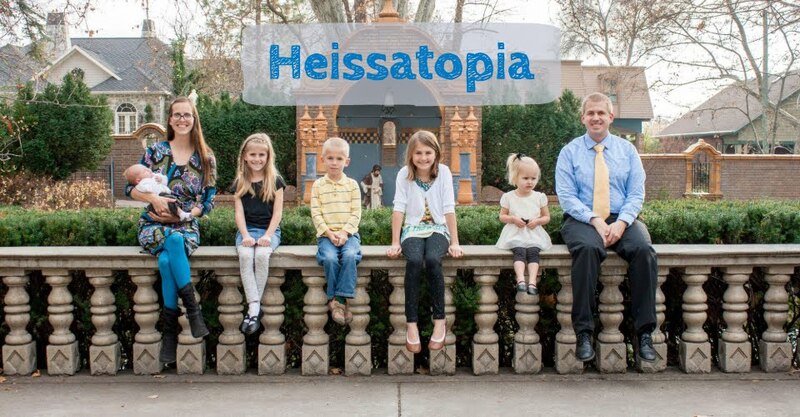 "Oh, we're the Heisses," I said with a grin, knowing full-well what would come next. "I should have recognized your husband then!" she gushed. "I thought your children looked suspiciously like Heisses. We just love the Heisses! They still send us a Christmas letter every year!" It was a good evening, even if it ended with Miriam running a fever and warning us from the backseat that "THROW UP IS TRAVELING THROUGH MY BODY!!" She didn't end up throwing up but I know that if she had, Andrew would've volunteered to clean it up (because that man's love runs deep). That was the sweetest post (and not because of the chocolate) until that awesomely hilarious line of Miriam's! I keep breaking into chuckles! Oh, how I love the Jacksons! Such great people. We'll make sure to get over and visit them next time we come. And I love that Rachel said she was hungry...haha. She makes me laugh. Why does everyone know the Heisses? This must be a Utah and/or Mormon story I don't know about. Do they run Provo or something? Aha! I'd forgotten that they lived in Durham years ago. Makes sense. I have enjoyed catching up on your posts this morning. I don't always comment, but I love reading about your family!